We don't just excel when it comes to repairing garage doors, our team is also extremely reliable when it comes to handling all types of gate repair services. We can handle all kinds of related services, from repair work, to new gate installation, and maintenance. Most modern gates today are automated, and so come with openers. If you're in need of a replacement, we know all the important features of each brand and will share our knowledge with you so that you can be guided when it comes to choosing the right unit for you. If you don't maintain gates that are electrically powered, it's likely they will eventually start to malfunction. Our technicians can perform thorough inspections on motors and other gate parts during our routine service checks. We'll replace small parts if required and apply proper lubrication to ensure a smooth working mechanism. Finally, we'll check everything is working safely and smoothly before leaving your property. When wheels are already worn out, there is no need to worry because we offer solutions for that. Our company is stocked with a range of different gate parts that come in all sizes. We will replace the damaged wheels for you with new ones so you can have smoothly functioning gate once more. Our expertise when it comes to residential gates is extensive. 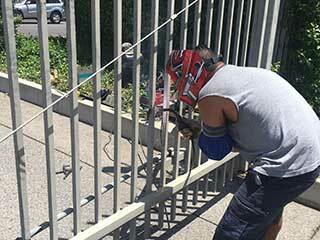 No matter what is causing your gate problems, we'll find the right solution to get it fixed within the allotted time. We use all the latest tools and equipment to perform repair services with the utmost efficiency. If you have not tried any services offered by our company, now is the right time for you to get in touch with us. Garage Door Repair in Ramona always welcomes new clients with a promise that we will exceed your expectations. We are available to answer your queries, any time of the day - all you have to do is give us a call!